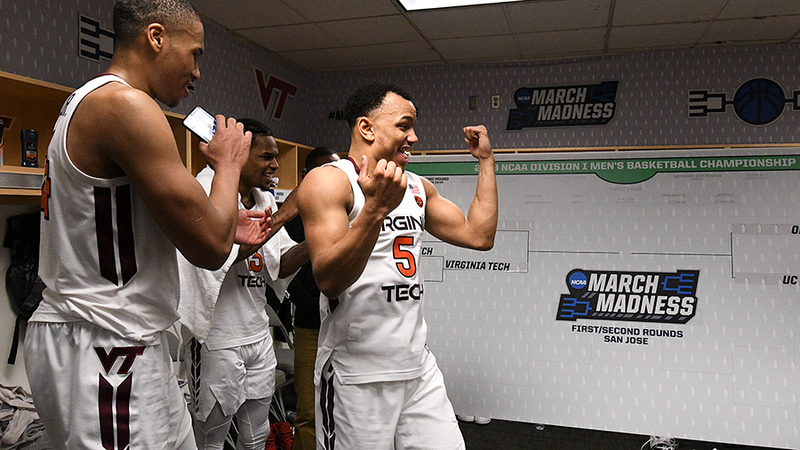 Outside of the opening of the second half, Virginia Tech's defeat of Saint Louis was methodical and went exactly as the numbers predicted. The Hokies forced the Billikens outside where 3-point attempt after 3-point attempt failed to fall (4-23). After halftime, the Billikens were able to force their own lane-driving style and made somewhat of a comeback. They cut the lead to 10 with 9:45 left, but ultimately foul trouble and a slowing Hokies pace kept the game from ever feeling like an upset in the making. Among a flurry of high seed upsets that did happen in the NCAA Tournament's opening round was the 12-seed Liberty Flames take down of 5-seed Mississippi State. Under normal circumstances, getting to play a high seed in round two would be a gift, but given the geographic proximity of the two schools there is no doubt that Liberty is extra motivated to pull a second upset by beating the Hokies. By the (Advanced) Numbers takes a look at what to expect when the Hokies face the Flames. The Massey Composite computer rankings collect rankings on every team across many computer rankings systems available. There's always one computer, isn't there. Otherwise, the success the Atlantic Sun champions had this season was always in the context of a smaller school playing weaker competition, data points easily accounted for by computers. The team isn't entirely easy to pinpoint, as various systems have them anywhere from around 40th to 120th (excluding the outlier computer). However, the Hokies' rating is quite clear and among the top teams in the country. Motivation aside, Virginia Tech is the much better team. Overall statistics are provided by the KenPom rating system and provide a breakdown for total team efficiency as well as offensive- and defensive-specific numbers. Much as Virginia Tech's rating is a combination of both strong offense and defense, Liberty's shows balance as well. The Flames are not excellent at either phase of the game, but they're not weak either. Pace: The number of possessions the team has averaged per 40 minutes of clock time. Total Rebound %: The percentage of possible rebounds — offensive and defensive — that the team gained. Assist %: The percentage of made shots that were assisted. Both teams play a similar style of offense, and if you like fast tempo, high-scoring affairs this one ain't for you. Look for both to practice a methodical, ball control offense. eFG %: Effective field goal percentage is a regular field goal percentage statistic but adjusted for the number of points the shot is worth. 3 Pt %: Rather than the percentage of 3-pt shots made, this statistic is the percentage of shots taken that are 3-pt shots. FTA per FGA: A reflection of a tendency to get fouled while shooting, this is the number of free throw attempts gained per field goal attempt taken. Again these teams are very, very similar offensively and the only meaningful gap whatsoever is the Hokies' ability to earn free throws. Both Scottie James (No. 31, R-JR, F, 6-8, 235) and Lovell Cabbil (No. 3, SR, G, 6-3, 170) average double-digit points per game, 12.9 and 11.7, respectively, and have an eFG% in the 90th percentile, 99.8 and 91.3, respectively. Both Cabbil and Georgie Pacheco-Ortiz (No. 11, JR, G, 6-1, 170) are dangerous from behind the arc. Each hit 45% of the triples they attempt, 47-104 and 39-86, respectively. Steal %: The percentage of opponent possessions that end with a steal. Block %: The percentage of opponent possessions that end with a block. Opponent Offensive Rebound %: The percentage of possible offensive rebounds gained by the opponent (so 100% - defensive rebound %). The defensive side of the ball is no different than offense — both are quite similar with slightly above average steal percentages, and slightly below average block percentages. The Hokies do allow a slightly higher percentage of offensive rebounds to opponents, although the team has played better opponents that are more likely to gain those. The shooting defense metrics are the same as the shooting offense metrics, but based on opponents' performance. The biggest differentiator between the two teams is in forcing opponents outside. Virginia Tech relies on making opponents take 3-pointers by controlling the lane, while Liberty still allows plenty of inside shots. The biggest gap between Saint Louis and Liberty is that Saint Louis thrives in the lane and was forced to play a different style; Liberty will be content to shoot from deep and certainly better at those shots. I felt really good going into the game against the Billikens as the Hokies defense matched up really well. Against Liberty I don't have the same confidence because Virginia Tech will force the Flames to play a style that they are comfortable (and decent at) playing. Additionally, the Flames will be incredibly motivated to knock off their in-state opponent. Winning this game won't be about opposing styles or matchups but rather simply being the better team — after all, this is still a 4-seed playing an overmatched 12-seed. This won't be the last BTAN of the season. Hey, I'd be happy with an 8-point win over a talented, in-state rival. I just hope we stay hungry and don't take anything for granted, cause you know we're going to get Liberty's best game, so we're going to need our A-game, or something close to it. If we can get past Liberty and into the Sweet Sixteen, that would be awesome. It would also give JRob another 4-5 days to work towards regaining his pre-injury form, which we will definitely need from that point on in the tournament. I've gone through the Massey Composite to look for the rogue model that has Liberty that high and the highest anyone has them ranked is 40th. Have you accidentally been including the standard deviation in your graph? For Liberty the standard deviation is 18.4. I've been wondering this same thing because the past few of these articles have had a highly ranked outlier somewhere around where the std deviation should be. That's the Joel Standard Deviation System™. Outlaw and Hill need to have a hot 3-point day. This will allow KBJ to have room to operate inside and the victory will be sweet! I do want to see KBJ hit a 3 (or several) to rattle his defender. Good catch...looks like before the tournament a ranking was removed, shifting things so that was included. Thanks! Just disregard that. Or use it as motivation. Whatever. Oh yeah, they seemed fine shooting from 8 feet behind the arc. Once they got cold and tried to get the ball I to the paint, we were able to pull ahead. Our guys also shot uncharacteristicaly poor in the first half and were bound to get back to average.